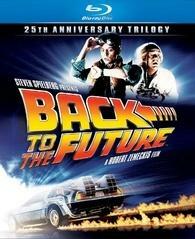 HDD Spotlight Bargain: 'Back to the Future Trilogy' Blu-ray $14.99 at Amazon! Great Scott! What a price on Robert Zemeckis' iconic trilogy on Blu-ray! Amazon has reduced the price of 'Back to the Future Trilogy' featuring Michael J. Fox and Christopher Lloyd to $14.99 (81% off suggested list price). This great price will be hard to beat, so hop onto your hoverboard and order your copy here!